Is It Surprising that P&G, Tide Struggle with Facebook Advertising? - For what brands and verticals *does* advertising within social networks work? For instance, we know it works within music. - At what cost does the advertising come? Is it measurable? - What tactics are successful advertisers using? Are there 'black hat' behaviors and, if so, does that prevent certain brands / verticals from succeeding? These questions are important because, despite Stross' well-written and researched article... it really shouldn't come as a surprise that P&G's Tide campaign doesn't work on Facebook. Do social networkers really want socialize around detergent? Even if they do - is that valuable for P&G? 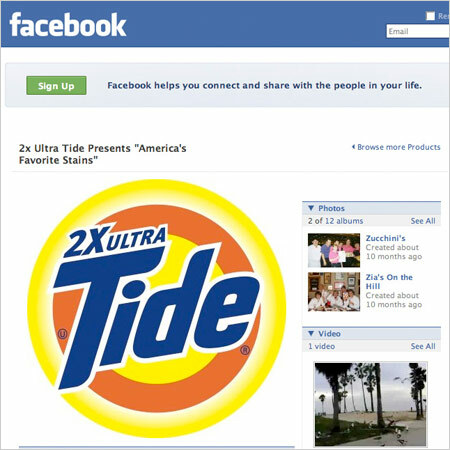 The “America’s Favorite Stains” campaign, offered on Facebook by Procter & Gamble, asks for members’ ideas. It recently displayed 18 submissions.